Bus-related crime across the capital fell by 18 per cent in the first year of Boris Johnson’s administration, and has fallen by a further 10.5 per cent in a ten month period taking the figures to a six year low. 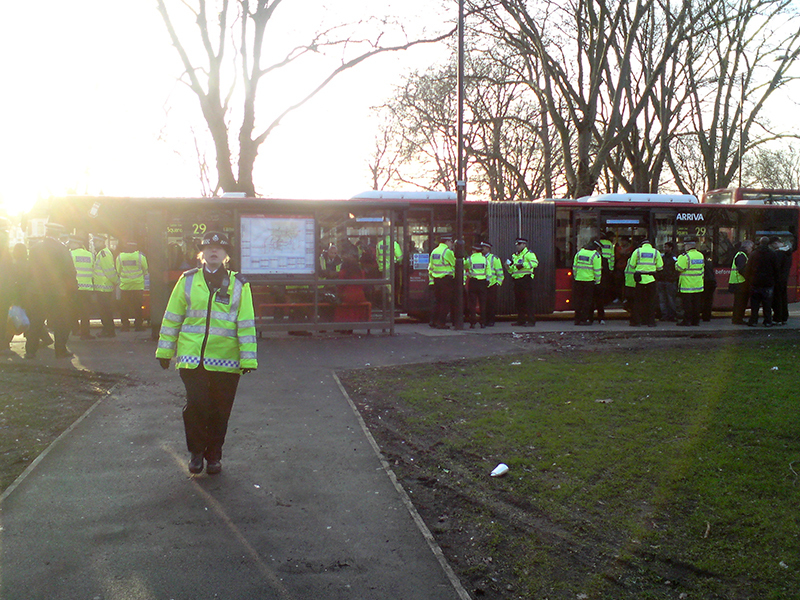 Dedicated to patrolling transport hubs in specified areas, the Mayor introduced 32 transport Hub Teams last year, including a team serving Harrow Bus Station and Harrow-on-the-Hill tube station, to increase visibility of policing on the transport network. That's a 29 bus with upwards of thirty police officers in and around it. You can't see it clearly in the photo, though, so I got a bit closer. "Excuse me! What are you taking a photo of?" yells the cop striding towards me. I blink. "The bus," I reply glibly. I'm thinking, if she starts to tell me I can't take photos of police officers this is going to be hilarious, but as it happens I'm late to meet someone and would rather not get into an extended debate about Section 44 abuses. She doesn't seem to know what to make of this, so to my relief she decides to drop it, although not without taking the opportunity to tell me off for riding a bike on a public path. 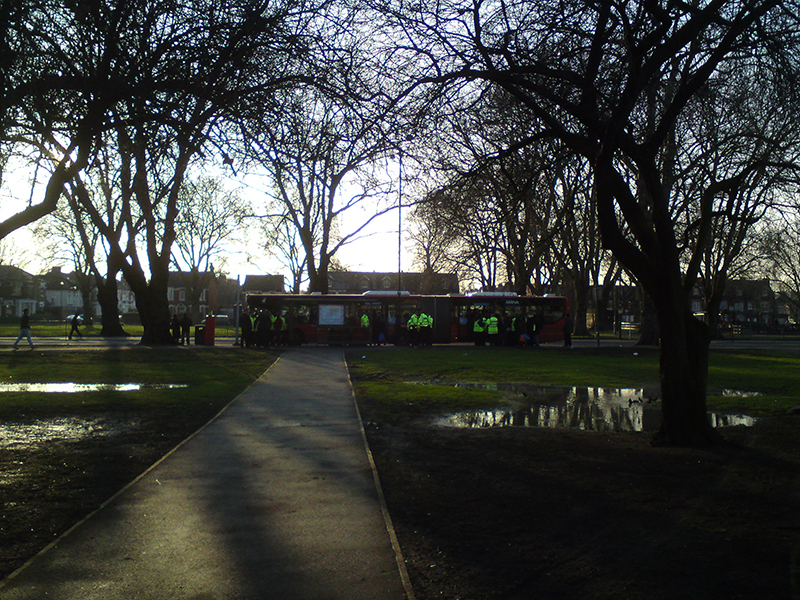 There were several people getting nicked, in little clumps of officers. I considered stopping to observe, but figured that this might not be the wisest course of action after antagonising one of them already. The whole thing seemed bizarrely over-the-top. I mean, I assume it's a fares raid, as they'd be unlikely to bag several violent criminals or vandals in one go. So why the show of force? Most of the people I saw were teenagers, old people. 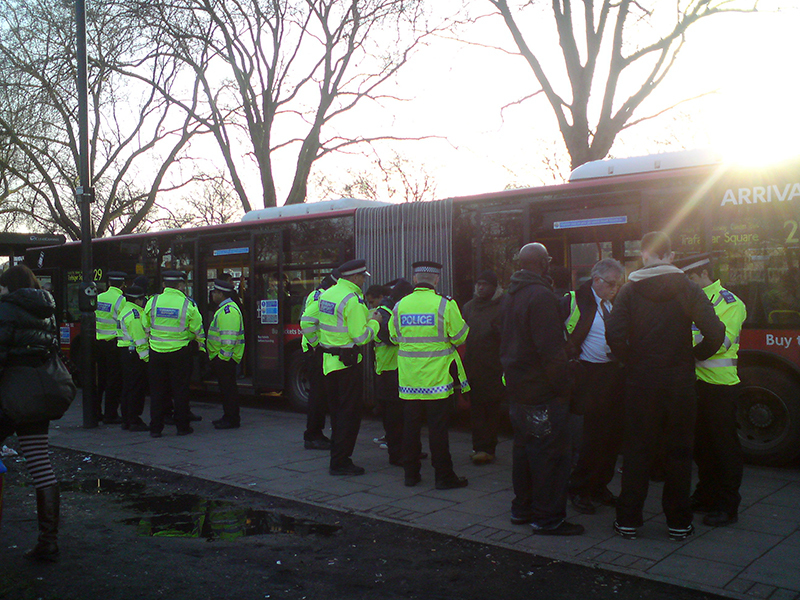 Are 40 police officers descending en masse really necessary? It's the 29, which tends to be used by a lot of people of colour because of the neighbourhoods it goes through, and it's probably spurious but I found it really hard not to see the numbers overkill in a social context. Are the scare tactics really necessary? Is there any purpose to the hordes of yellow jackets other than to scare people? The bus crimes that worry me are violent assault, sexual assault and sexual harassment. Let's be honest, the chances of those forty coppers jumping the bus at exactly the moment that you're being threatened by someone are slim. It can't be about that. I can also see the need to police fares and vandalism; CCTV pretty much deals with the latter, and fares are usually dealt with by conductors. I understand that the bendy buses have made it easier for people to get off through one door while a conductor or copper enters through another. So having a cop or two at each door is a plausible solution to that. But ten at each door? Really? Is that necessary? Is this about reducing crime, or is it about intimidating people, being seen to reduce crime, and getting some drugs busts in there while you're at it? Mind you, I probably just find it hard to take any policing strategy that prioritises catching fare-dodgers from the poorest areas of the city over bringing people like, say, Lord Ashcroft to justice. I am sure that London is being defrauded in more significant ways than by the passengers on the 29 bus. But passengers on buses are easier to intimidate. Especially if there are forty of you.